In most areas people are now using more "scientific methods", including chemical fertiliser and pesticides, and yields appear to have risen, but farming clearly remains hard in this unforgiving terrain. "This area is high and cold… In other villages, people can yield much grain from one day's work. Here, we work many days but still cannot yield as much as theirs in one day's work" (China 24). Several point out that they have to exercise considerable skill and judgement, and seize the right moment for planting and harvesting, because a sudden weather changes, including harsh frosts, can easily destroy the best part of a crop. Women do most of the farming, as the majority of the men find employment in towns and cities away from the mountains. Most seem to return to help their wives with the harvest or at other times when workloads are heavy, but some don't dare risk losing their jobs. Clearly the women have to labour extremely hard; several describe a relentless agricultural cycle. One Lahu woman (China 16) is an agricultural extension worker. She talks with enthusiasm of her job and of the hybrid paddy she promotes, but she feels that her people's low levels of literacy hamper their ability to learn and apply new techniques. One older Wa woman agrees that new tools, techniques and seeds have lightened the burden of weeding and cultivating the land but at the cost of tree cover: "In the past, it was tough for people to farm the land… Trees were thick and weeds were tall…A lot of labour has been saved… [People] don't have to cut big trees and tall grasses…[but] don't you see that every mountain is barren?" (China 10). Several say that the adoption of the household responsibility system has increased agricultural production: "In the past, a group of people worked on the same piece of land. You dug on the piece of land and I would not labour more than you did. People didn't want to work hard. Like, when we grew the potatoes, we just threw them there and didn't care if they grew well. Now you grow potatoes, and you will get the yield" (China 25). And growing tobacco has made a major difference to rural incomes: "Now people in the countryside cultivate according to scientific methods, so their income is really high. Especially because of growing tobacco, the income…is really good" (China 12). The same narrator says that those who cultivate only wheat and corn (the majority), because local conditions do not favour rice-growing, can now afford to exchange these crops for rice, a sign of greater wealth. But it is important to note that these interviews were gathered in different localities; it's clear that some women can't afford fertiliser and other inputs. A couple of narrators seem to grow tea to sell. Almost all mention how vital improved transport is for them to market their produce. Overall, however, most women seem to feel that farming is likely to remain precarious, and several stress the need for factories which would allow them to process their produce locally, and provide other opportunities for work. "Our place is not like other places. The water and soil in other places are warm, and grain can be harvested twice a year; in our place, the water and soil are cold, we can only harvest once a year." "[We grow] corn, potatoes, buckwheat… You can grow vegetables only if you work hard. If you don't grow them well, you won't be able to eat. You have to seize the season, because in this cold mountain area, the frost is heavier. If you plant it late, you'll have no yield. Frost comes even in August and September." "Techniques for growing crops? We can only use buffalo to plough the land. People use their hands and tools to dig the fields, which are stony. It's good to use chemical fertiliser, but our financial situation cannot catch up (keep up with the cost)… [and] it's very good to use the plastic film [to protect seedlings]. But we cannot afford to buy it." "Now every family will apply fertilisers twice a year… The [crops] are good, because we have enough chemical fertilisers…We don't eat the corn rice any more (a mixture and cheaper than pure rice). Only one or two families still eat corn. Corn and potatoes are used to exchange for rice to eat. 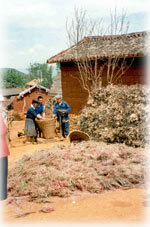 The tobacco is sold and the money earned is used to build houses, buy furniture and clothing. We don't need to spend money on food." "In the beizi [plaines], there are large plots of paddy, while in the mountains the plots are mostly fragmented and small… In the beizi, whatever you plant, it yields; while in the mountains, it's harsh for any planting, the land is infertile. Some labour and get food; some labour but in vain."